Poinsettias are a favorite holiday floral decoration. This is a guide about selecting and caring for poinsettias. Since the 1920's, the poinsettia has become synonymous with the holiday season. Here are a few tips for selecting and caring for this year's poinsettia, as well as some advice for getting it to bloom again next year. Bract Color: When selecting a poinsettia, there are a few things you need to know. First, the showy parts of the plant are not actually the flowers. Instead, they are modified leaves called bracts. Select a plant with fully colored and open bracts-avoiding bracts with green around the margins. Because poinsettias now come in shades from red to white and every shade in between (including purple, yellow and salmon), make sure you check the variety to ensure the bracts are displaying their mature color. Unopened Flowers: A poinsettias true flowers are yellow and tiny and located in the center of the flower-head. Plants with unopened flowers will last longer. Freshness and Overall Health: Select a plant with healthy green colored foliage from the flower heads to the base of the stem. Stems should be stiff and the plants should have good leaf retention. Avoid plants that show signs of wilting, damage or soil that is saturated or too dry. Shape and Proportion: A healthy plant will appear balanced and full from all sides and be appropriate in height and shape relative to the container it's in. (generally 2 1/2 times taller than the diameter of the container). 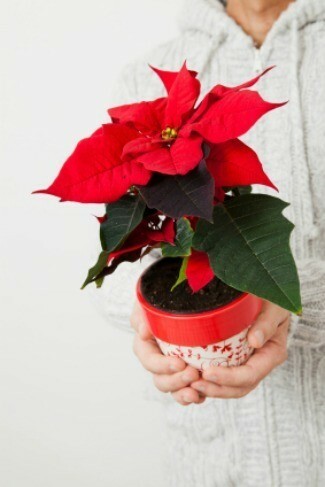 Temperature and Location: Poinsettias need at least 6 hours of exposure to indirect, natural light daily. To maintain good color, direct sunlight should be avoided (or at least diffused) and daytime temperatures should not exceed 70 degrees. Keep plants away from excessive hot or cold drafts, like those from heat ducts, fireplaces or outside doors. Food and Water: Poinsettias appreciate moist soil. Water thoroughly so the soil is moist, but not saturated. Overly moist soil can lead to root rot and eventually kill the plant, so poinsettias should not be allowed to stand in water. Plants are often purchased covered with plastic, paper or mesh sleeves. If you plan on keeping your poinsettia after the holidays these should be removed and the plants repotted in order to prevent the plant from deteriorating. Fertilizer isn't necessary during the flowering period. The Poison Myth: A common misconception about poinsettias is that they are poisonous to pets and children. They are not. According to joints test conducted by the America Society for Florists and Ohio State University, a 50 lb. 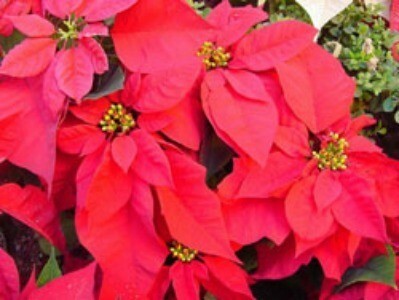 child would need to eat 1 1/2 pounds of Poinsettia bracts to shows signs of toxic poisoning (a bad stomach ache). In regards to the family pet, anything your pet eats that is out of the realm of their normal diet may give them an upset stomach. Ingesting large amounts of the bracts and flowers may cause skin, eye and mucous membrane irritation in pets. Wilting, followed by loss of leaves: This is usually a symptom of improper watering. Allow the surface soil to dry a bit before watering, but make sure the compost around the roots stays moist, but not saturated. Loss of leaves without wilting: This is often a sign that the plant has been subjected to hot or freezing drafts. Other reasons for leaf drop include poor light or night time temperatures being too low. Leaf edges are yellow or brown or loss of flower-heads: Dry, indoor winter air may be the culprit. Poinsettias like warm rooms with moist air. Mist leaves frequently with a spray bottle. The poor poinsettia. Its bright show of color has become synonymous with holiday decorating, but it's often thrown out when the holiday decorations come down. In its native Mexico, it's actually a perennial that grows up to ten feet tall. If you're like most gardeners, you wince at the thought of throwing out a plant just because it's done flowering. You will be happy to know that with a little care and patience, you can "recycle" your poinsettia and get it to re-flower next year. Poinsettias naturally come into full bloom sometime in November or December as the days grow shorter (and nights grow longer). As the bracts ("flowers") start to age and lose their color (usually late March or early April), cut plants back to about 6 to 8 inches in height. The pruning done in March or April will promote new growth by the end of May. You may need to prune again during the summer to keep plants bushy and compact, but don't prune them after September 1. Continue to water and fertilize ever 2 to 3 weeks. Plants should be kept in a soil mix containing high amounts of organic nutrients with good drainage. In early June, plants may be transplanted into pots that are no more than 4 inches larger than the original pot. In general, poinsettias are sensitive to cold weather, frost and rain, so moving them outdoors is not recommended. If you want to move yours outdoors, wait until night time temperatures stay above 55 degrees. Start by acclimatizing the plant to outdoor light by placing it in a shady location for a few weeks. Then sink the entire pot into a sunny well-protected flower bed. Turn the pots every 2 weeks to keep the plant from rooting through the pot's bottom holes. Here comes the tricky part. Starting October 1st, poinsettias need at least 14 hours of COMPLETE darkness to set their flowers. The smallest amount of stray light (street lights, night lights, etc.) can delay or even stop the re-flowering process. One way to avoid this is to place a tall box over plants at night. During October, November and early December, the plants also require at least 6 hours of bright sunlight daily and night time temperature between 60-70 degrees (temperatures outside of this range can also delay flowering). Watering and fertilizing should be carried out as usual. Following this disciplined "photoperiod" for 8 to 10 weeks will get your poinsettia blooming just in time for the holidays. I have a six year old poinsetta which I trained to be a tree; it is beautiful in the summer with lush green leaves; I cut it back in October and bring it in; new growth begins about a week later and the beautiful brachts appear in late February!! I find that the only poinsettia that is safe living with me is a FAKE one! I have never been able to take one of those beautiful, living plants and have it last past Christmas. I saw one once that was planted outside in Florida and had grown about five feet tall, it was lovely. Maybe my solution would be to move to Florida? !